A few weeks ago my friend Alejandra and I drove about an hour and a half north of San Francisco to spend a few relaxing days in Healdsburg, California. 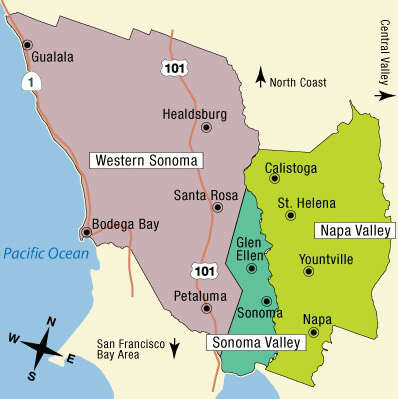 For those of you who are not as familiar with the geography of wine country, Healdsburg is a small town in Sonoma County filled with rustic charm, casual yet sophisticated restaurants, and some of the best wine the United States has to offer. Alejandra and I settled into the serene Hotel Healdsburg in the main town square, and began our routine of vineyard hopping, restaurant grazing, and attempted escape from our normal and hectic lives in Washington, D.C. We had a wonderful time exploring wine country, and below are some of my favorite places we visited along the way. A few of the places we visited included Ridge Vineyards, Lambert Bridge, Arista Winery, and Iron Horse Vineyards. We also enjoyed tastings with Cartograph Wines and Two Shepherds. I was introduced to Ridge back at an event earlier in 2014 called the Rhone Rangers, and it has remained a favorite of mine since then. I decided to join their ATP wine club which will allow me to try Zinfandels and other Rhone varietals such as Carignane and Syrah moving forward. I am excited for my first shipment in February. We also loved the setting at Arista with a beautiful outdoor Japanese garden and a stunning view. Alejandra joined the wine club at Lambert Bridge, and I was happy to bring home their 2011 Dry Creek Zinfandel and the bright and fruit forward 2010 Petite Sirah. The view at Iron Horse is not to be missed-- it sits on the top of a hill overlooking Sonoma County, and their sparkling bruts are light and refreshing. At the Cartograph tasting room in Healdsburg we enjoyed Pinot Noir's from the Russian River Valley, and Two Shepherds delighted us with their 2012 Syrah, and their complex 2013 Cinsault. Most of the vineyards and tasting rooms were within a 20 minute drive from Healdsburg, and made for easy planning. On our drive up from San Francisco we decided to make a pit stop at The Fremont Diner for a hearty and comforting lunch. The diner is in a tiny little shack that most people wouldn't think to give a second look, but don't be fooled. It has a mean kitchen staff that drums up a killer grilled cheese and tomato soup, burgers, and all sorts of goodies including homemade biscuits and chili cheese dogs. This dive is absolutely worth the pit stop on the way out to wine country. The Fremont Diner is located at 2698 Fremont Drive/CA Highway 12/121 in Sonoma, CA. This was my favorite meal of the whole trip. Scopa is a small and comfortable Italian gem located in the center of the Healdsburg town square. It's a narrow restaurant with walls covered in brick, and the menu has just the right amount of options including antipasti, pasta, pizza, and their famous tomato braised chicken. We shared a rich cauliflower budino to start which was topped with an egg and shaved cheese, and I had the sugo calabrese as my main course. The dish was a spaghettini with tomato braised beef and pork rib sugo topped with Pecorino Romano cheese. It was perfection in a bowl. Scopa is located at 109A Plaza Street in Healdsburg, CA. We also dined at their sister restaurant Campo Fina which is worth a visit. After a few wineries in the morning, one is sure to work up an appetite. We went back into town just a few steps down from Scopa to dine at the classy Bistro Ralph for lunch. The meal started with warm bread and butter, and we split the macaroni and Manchego gratin which was creamy and delicious. For my main course I had the chicken paillard which was pounded breaded chicken breast topped with brown butter, lemon and capers, and served with fingerling potatoes. Alejandra sprung for the classic burger accompanied by a plate piled high of shoestring fries. It was a satisfying and enjoyable meal. Bistro Ralph is located at 109 Plaza Street in Healdsburg, CA. The only reservation we made in advance of our trip was at Bottega in Yountville, CA. We drove about an hour into Napa Valley and started the evening with cocktails at Thomas Keller's Ad Hoc, followed by dinner at Michael Chiarello's Bottega. Alejandra and I were both pleasantly surprised at how casual and laid back the atmosphere at Bottega was. Given the notoriety, we expected it to be much fancier. The meal started with a house-made sourdough bread and a spread of cheese, oil, and spices. We enjoyed the octopus and Brussels sprouts salad as our appetizers and each ordered a pasta for our main. The potato ravioli with spinach and ricotta did not disappoint, and we finished the meal with a delicious chocolate cake. Bottega is located at 6525 Washington Street in Yountville, CA. Perhaps the prettiest setting of all, Barndiva is located inside of a rustic and charming shed in Healdsburg. We went for a late lunch one afternoon, but the restaurant and cocktail lounge is also open for dinner and used for private events. They define their style as "modern country cuisine", and we started the meal with goat cheese croquettes topped with lavender honey. I indulged in a filet mignon burger with aged cheddar and tomato marmalade. The atmosphere is lovely, and the food is wonderful as well. Barndiva is not to be missed. Barndiva is located at 231 Center Street in Healdsburg, CA. This is a food lover's paradise. I was drooling from the minute I walked in the door. The SHED is a gorgeous wonderland of food products, organic produce, beautiful housewares, a coffee shop, and a sit-down restaurant. Not only is the space gorgeous, but the baked goods were lovely, and I was happy to slowly sip my latte and enjoy the atmosphere. If I lived in Healdsburg I can guarantee I would be here every morning. I would love to see this type of concept thrive in a place like D.C.-- any takers? The SHED is located at 25 North Street in Healdsburg, CA. On our last night we came to dinner at Chalkboard on the recommendation of many of my Twitter friends. We were very happy that we listened. We each had an interesting wine flight to start the meal, and we split the Dungeness crab tater tots to start. They were topped with crème fraiche and chives, and were just as interesting as they sound. The tater totes were molded into square patties, and the potatoes were shredded thinly. The crab was delicately placed on top, and all of the elements worked perfectly together. We also enjoyed the pastas that evening including a ricotta gnudi with maitake mushrooms, and a cocoa carbonara with pancetta and egg yolk. We finished the meal with three donuts including a chocolate pudding flavor, a bacon flavor, and an old fashioned cake donut that provided a sweet ending to a great dinner. Chalkboard is located at 29 North Street in Healdsburg, CA. It was a wonderful trip to California filled with great meals and great wine. We now get to continue the experience with all of the bottles of wine we brought home, which will remind us of the memorable time we had in Healdsburg.